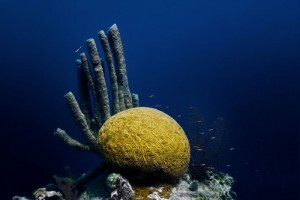 The Great Blue Hole, off the coast of Belize is a diver’s paradise. Located next to Lighthouse Reef, about 70 kilometres off the coast of Belize, the Great Blue Hole is part of the Belize Barrier Reef Reserve System that was declared a UNESCO World Heritage Site in 1996. Originally the Blue Hole was a limestone cave that started to form about 150,000 years ago. Gradually the water level rose as the glacial period ended and the caves were flooded and its roof collapsed, thus forming this unique hole. Looking from above, the dark blue color of the hole signifies that it has a great depth, especially compared to the shallow waters nearby. 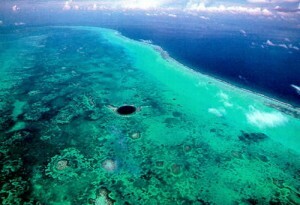 Its deepest point lies at 124 meters. The hole has an almost perfect circular shape and it is 300 meters wide. The Blue Hole is well known among the world of recreational diving enthusiasts, for whom this place has them all: clear waters and a variety of flora and fauna as you can meet here nurse sharks, Caribbean reef sharks and bull sharks. But if diving is not for you, you can also snorkel for a full day around the hole and nearby. And the Turneffe Islands, the largest of three atolls about three hours by water from Belize City. Out of these, the Turneffe atolls are closest to the blue hole.